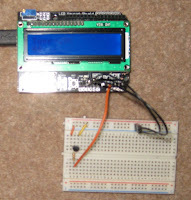 One of the problems with the DRobotics Arduino LCD shield is that the documentation suggests the use of a LCD_4Bit_mod 'd library. This leads to all sorts of fun and games when attempting to print floats and anything else other than chars or ints. I gave up. I like to use standard libraries and code wherever possible so decided to wade through the .cpp to find the pins, to allow them to be mapped onto the standard Liquid crystal code (LiquidCrystal.h). The second problem is that the DRobotics shield doesn't use the nice passthrough pins found on other shields so I ordered the Arduino header pins from coolcomponents.co.uk and soldered them on. This is my temperature probe test circuit - cribbed from here. LiquidCrystal library with DRobotics shield. Pins configured with DRobotics LCD shield. Example circuit for printing temperature from an LM34. Many, many thanks. I've just been banging my head off the desk over the same issue. I guess many folk like me will buy this LCD PCA to get up the learning curve quickly only to stumble badly with the supplied library. But what about the keyboard support? Sorry about the lack of keyboard (cursor key) support. It wasn't something that I was interested in. I just wanted a cheap LCD shield working with the standard libraries and this seemed like the quickest way to do it. I guess you have two choices - hack the keyboard parts into your own header file or work with the supplied DRobotics library. If you have any success, please let me know. I'm happy to modify my code as and when people tell me I should!